I do not remember how I stumbled across this company but I am glad that I did. 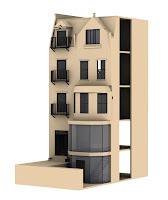 Based in Uruguay (South America), World Wide ArchistylesClub produces architectural scale kits and fully built models of dollhouses in three scales—1:12, 1:24 and 1:48. The kits are all laser precision cut MDF and touted as having such a perfect fit that there is almost no need to use any adhesive for them. I’m partial to their 1:12 Boston model ($338 which includes shipping) pictured above. It’s a 4-story high (plus underground space) apartment building with a retail space on the main level. Although it is an older period style of architecture, I think it could be phenomenal if decorated in a modern style. 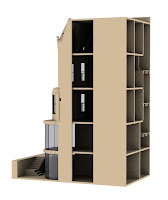 I am hoping that they add a collection of modern style dollhouses to their standard offerings, but they do build custom structures and encourage commissions. Prices for personal designs start at $550 and are based on the level of complexity to create. 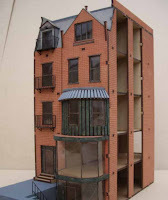 The company built a miniature museum for a dollhouse hobbyist in Florida and the structure cost $1200 to be produced. 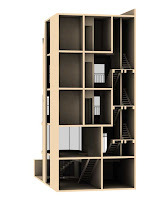 I wondered what it might cost to build a simplified 1:12 version of The Living Home as a kit (pictured below). The estimate process was great because they asked if I would also want the built-in cabinetry and closets—hee hee, why, yes, I would! The pre-estimate for such a structure came back at $1800. You can view the entire collection of World Wide ArchistylesClub kits and models at www.arquikits.com. Thanks for the link, that townhouse is awesome! I've been planning on getting a RGT 333 Franklin Street Townhome and aging up some bricks and doing all kinds of trim, but making it really mod on the inside. I bought a 1:87 scale dollhouse at the aztec show Aug 23, 2011 and would love to get the 1/24 scale dollhouses but I can't find the websight for these houses. Tried everything possible. could you please send me the websight. The one you listed doesn't work. Click the link on the website at the top right that says "Contacto" and fill out the contact information in English. They do speak English too so you should be able to smoothly coordinate a transaction via email, etc. Let me know if you have success, friend.